This reference book is designed as a road map for researchers who need to find specific information about American mass communication as expeditiously as possible. Taking a topical approach, it integrates publications and organizations into subject-focused chapters for easy user reference. The editors define mass communication to include print journalism and electronic media and the processes by which they communicate messages to their audiences. Included are newspaper, magazine, radio, television, cable, and newer electronic media industries. 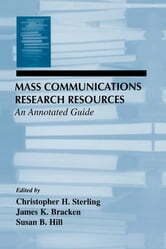 Within that definition, this volume offers an indexed inventory of more than 1,400 resources on most aspects of American mass communication history, technology, economics, content, audience research, policy, and regulation. The material featured represents the carefully considered judgment of three experts -- two of them librarians -- plus four contributors from different industry venues. The primary focus is on the domestic American print and electronic media industries. Although there is no claim to a complete census of all materials on print journalism and electronic media -- what is available is now too vast for any single guide -- the most important and useful items are here. The emphasis is on material published since 1980, though useful older resources are included as well. Each chapter is designed to stand alone, providing the most important and useful resources of a primary nature -- organizations and documents as well as secondary books and reports. In addition, online resources and internet citations are included where possible.